For two years, Chien-Ming Wang looked like a top of the rotation starter. He didn’t blow away hitters, but instead fed them sinker after sinker, forcing them to hit the ball on the ground. Keeping the ball out of the air meant keeping the ball in the park, leaving Wang with the best HR/9 rate in the AL for both 2006 and 2007. This, combined with a low walk rate, kept his FIP under 4.00, despite the poor strikeout rate. Wang then opened the 2008 season in grand fashion, allowing just 19 runs, including one home run, and walking 19 in 59 innings. Making matters worse for opposing batters, he also started striking out more hitters, 38 in those 59 innings. It appeared he was taking another step forward. But then something changed. On May 18 Wang gave up seven runs in seven innings to the Mets. He followed that by allowing five or more runs in his next three appearances. Those unconvinced that Wang’s true ability matched his early season performance might have called it a statistical correction, but there seemed to be more at play. In 2006 and 2007, and even earlier in 2008, Wang released his pitches from a three-quarters arm slot. 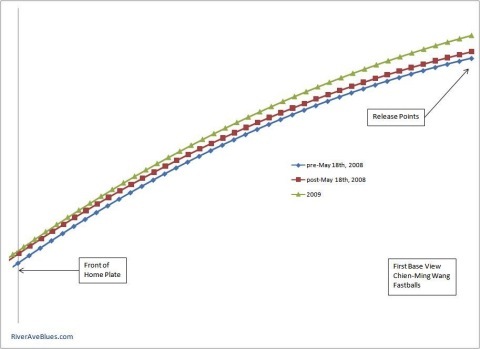 Beginning with his May 18 start, that release point move upward, as shown in the following three graphs. 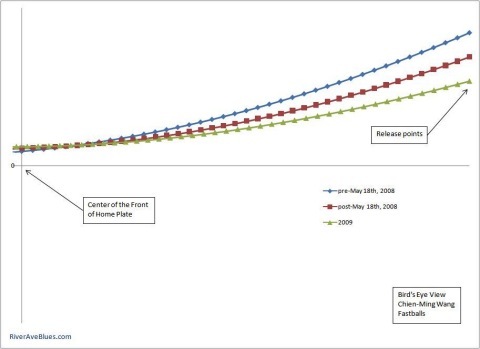 Those graphs, as you can see, also contain 2009 data, which we’ll get to in a moment. The higher arm angle didn’t seem to work for Wang, though we didn’t get a large enough sample to make any real determination. On June 15, during an interleague game in Houston, Wang fractured his lisfranc, ending his season. Wang appeared ready to return in 2009, and looked fine in spring training. His first three starts, however, went as poorly as possible, as he allowed 23 runs over just 6 IP. The Yankees placed him on the disabled list with what they termed “hip weakness,” but the move was really to buy them time to figure out what was wrong. He returned on May 22, but continued to struggle. His season eventually ended on the Fourth of July, as he dueled with Roy Halladay in the Bronx. Later that month we learned he would need surgery to repair a torn ligament in his shoulder capsule. Back to the above graphs, it’s clear that Wang released his sinker from an even further over the top arm slot in 2009. This caused many of his pitches to fall flat. So flat, in fact, that PitchFx categorized many of them as two-seam fastballs. Wang had thrown just under 5 percent two-seamers in 2008 — which could also have really been flat sinkers — and that number jumped to 22.9 percent in 2009. His fastball took a somewhat corresponding hit, as he threw it 73.6 percent of the time in 2008 and only 56.8 percent in 2009. We learned earlier today that the Nationals will announce that they’ve signed Wang at a press conference on Friday. While his recovery from shoulder surgery remains the foremost concern, the Nationals also have to work to get his release point back to where it was in 2006, 2007, and early 2008. It seems that’s a big part of his sinker’s success. Without that bread and butter pitch Wang has a much lesser chance of recovery to his previous form. A big thanks to my buddy Jay Gargiulo and my friend and colleague Mike Axisa for putting together much of this data. The three of us are going to miss having Wang in the Yankees’ rotation. We hoped you liked reading Chien-Ming Wang Presents Risks Beyond Injury by Joe Pawlikowski! 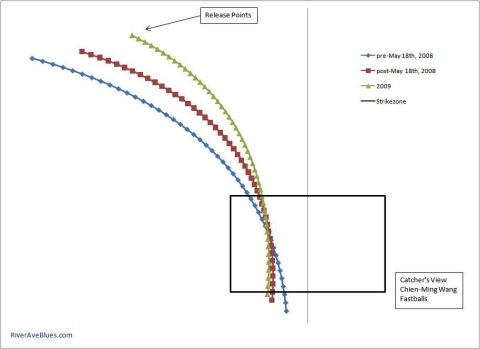 could it be that wang changed his throwing angle as a result of the injury? that would reduce/eliminate the risk you are proposing. There didn’t seem to be a physical issue underlying his change mid-2008. I’m not sure about 2009, but if it was the result of injury it’s still something he has to correct.